Nearly everyone loves s’mores and they are so fun to make! 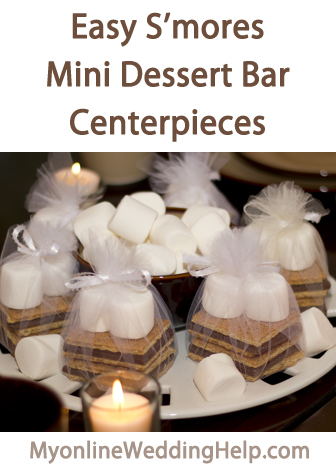 They are a natural for outdoor dessert stations, but we tweaked the idea for use as favor centerpieces. 1. S’mores ingredients: chocolate bars, graham crackers, and marshmallows. 2. Skewers (or forks) to hold marshmallows. 3. An indoor flame: non scented pillar candles (better than votives in the photo) or Sterno cooking fuels (works even better). 4. Glass platters. Plastic is doable, but I’d be wary of them getting melted. How to put the centerpiece together. 1) Make two chocolate and graham cracker “sandwiches” for each favor pouch and top with two marshmallows. 2) Make the pouches: Set each s’more stack in the center of a circle or rectangle of tulle, and pull it up over the treats. To secure, tie a small bow with ribbon. Then cut off the excess tulle and ribbon (I like them better longer, but too many potential fire hazards that way). 3) Set the Sterno in the center of each platter and surround with enough s’mores for everyone at the table. OR, if you want to do it like we did, place a bowl of marshmallows in the center and surround the platter with candles. Supply your guests with something to use as skewers and you are done!